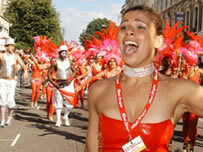 Maite grew up in Sao Paulo and became involved with samba whilst attending community events. She came to England in 1990 and joined Dudden Dance before founding the Viramundo dance group. She taught dance at London School of Samba for 4 years and was involved in many events such as Brazilian Way , Marc Almond, Alcione at the Albert Hall, the Generation Game. She taught workshops in Amsterdam and at Queen Elizabeth Hall for professional dancers. For 4 years from 1999, Maite taught dance as part of Nucleo Mae Maria project in deprived areas of Campinas in Sao Paulo state taking street children, teaching them to dance and helping them to develop skills and gain focus in their lives. Maite returned to London to work with Paraiso and now teaches dance in Paraiso’s Greenwich Schools project and weekly dance workshops.